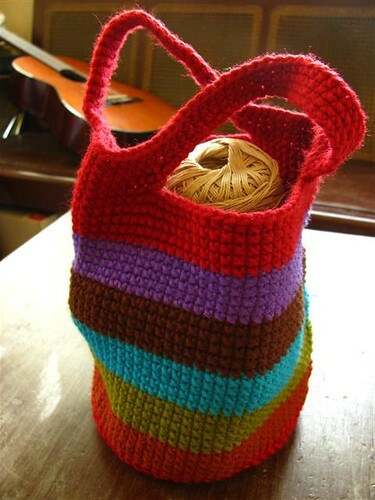 Here's a striped bag I made a year or two ago which I just kept in my locker. It's a simple single stitch crochet which obviously was more time-consuming than other methods. I love how all the colors combine but never got to use it and just had it piled along with my other unfinished projects. My sister is giving it to a friend and that makes me glad because it'll finally be put to use. I have been so busy with other things but really miss crafting. It's a lot easier to crochet tiny things. Here are some of the bags I crocheted for Barbie. Shoes in the photos are from Mattel. This is one of my Barbies. She's not my favorite but I like her because she's got a belly button unlike the older dolls I have. It's also easier to make her dresses because her figure is more realistic. I'm hoping to upload images of the doll clothes I made. I just love making tiny dresses, caps and even bags.